John Thistle’s book on the history of the grasslands of British Columbia’s interior is the winner of the fourth annual Basil Stuart-Stubbs Prize for Outstanding Scholarly Book on British Columbia. The $1,000 prize, given by UBC Library and the Pacific BookWorld News Society, will be awarded at UBC’s Irving K. Barber Learning Centre in June. The book, Resettling the Range: Animals, Ecologies, and Human Communities in British Columbia is a new study of the occupation of the Cariboo-Chilcotin region by ranchers and other settlers. Thistle’s book examines the ecological and historical impact of the settlement including eradicating grasshoppers and wild and feral horses from the grasslands. Resettling the Range explores the profound consequences of eradication efforts in the BC interior in the late nineteenth and early twentieth centuries including the alteration of the ecological balance of the grasslands and the impact on the indigenous people in the area. Thistle is a PhD graduate from UBC’s department of geography and was most recently a Research Associate at Memorial University’s Labrador Institute where his work focused on the social, economic, and environmental legacies of large-scale resource extraction. Thistle’s teaching and research interests span environmental history, economic geography, and science and technology studies. 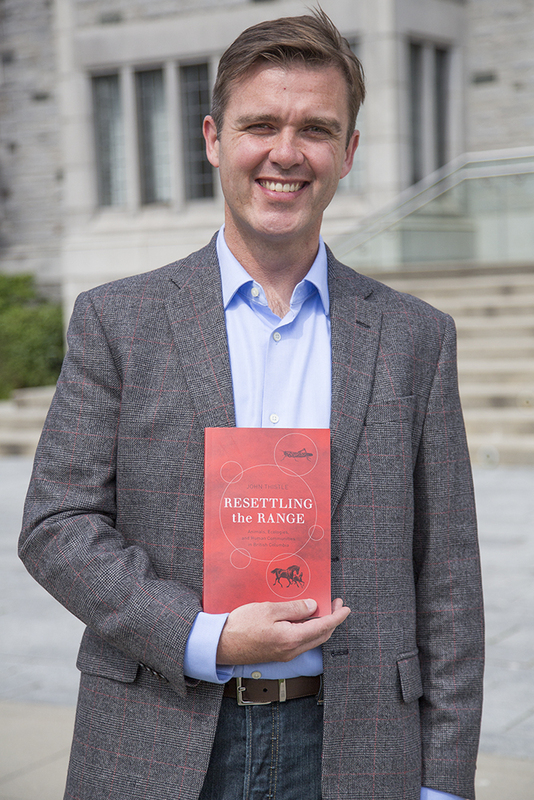 Resettling the Range is his first published book. The two other finalists are: Lisa Pasolli’s Working Mothers and the Child Care Dilemma: A History of British Columbia’s Social Policy (UBC Press) and Maria Tippett’s Made in British Columbia: Eight Ways of Making Culture (Harbour Publishing). The Basil Stuart-Stubbs Prize for Outstanding Scholarly Book on British Columbia was established in memory of Basil Stuart-Stubbs, a bibliophile, scholar and librarian who passed away in 2012. Stuart-Stubbs was formerly University Librarian at UBC Library and Director of UBC’s School of Library, Archival and Information Studies. The award, generously supported by donors, pays homage to his leadership role in many national and regional library and publishing activities, particularly in the production and distribution of Canadian books and Canadian publishing.